What does the term salvaged mean? What does a "salvage" or branded title mean? 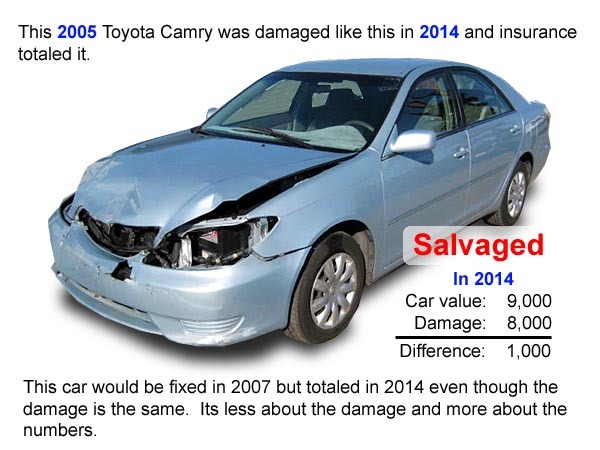 The example above illustrates how the numbers work when it comes to insurance companies deciding what to do with a damaged vehicle. Their number one priority is to spend as little money on the claim as possible, so its all about the numbers. Vehicles typically lose about half of their value every five years, so WHEN the damage occurs affects the numbers more than how bad the damage is. 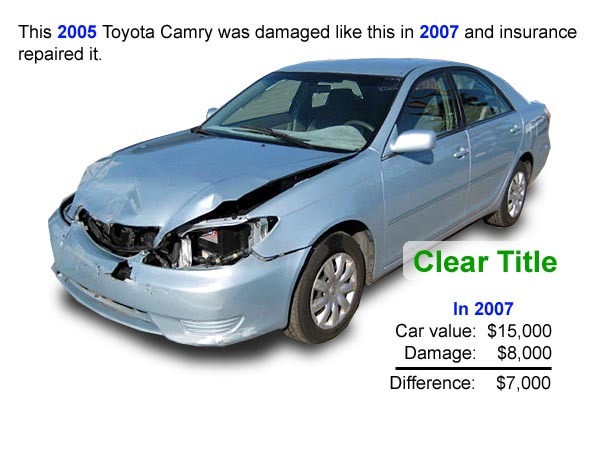 When this Camry was two years old it still had quite a bit of value, so when it had $8,000 worth of damage it was cheaper for the insurance company to fix the car. When the same amount of damage happens to this car when its nine years old its cheaper for the insurance company to consider it a "total loss", not repair it and sell it at an insurance auction. Once you understand how the numbers work you realize that there's an ideal age versus value that plays into the numbers working in your favor if you want to buy a wrecked vehicle and repair it. In other words, when the vehicle is older it doesn't take much damage to total it.